I was recently contacted by a member of the University of British Columbia Animal Welfare Program, who invited our members and supporters to complete a survey on the use of animals in science. The survey should take about 10 minutes and requires you to sign up (shouldn’t take long). So when you have a few spare minutes please take a look at it. 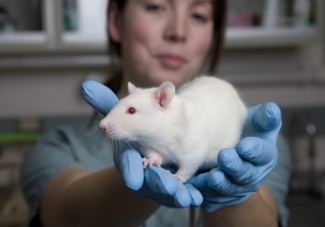 Lab Views is a place to discuss issues relating to the use of animals in science. Here you will be able to see the views of others and add your comments. Lab Views is also a platform for scholarship. Your comments help ground our work on these topics and increase our understanding of these issues. We would like to hear your views on six specific research projects that propose the use of animals. These projects cover a range of procedures and types of animal use. We also ask your views on how animal use should be governed and what information about animal use should be made public. This research was conducted by the University of British Columbia Animal Welfare Program, not the Canadian Council on Animal Welfare as stated earlier. Posted on June 1, 2011 April 14, 2014 by EditorPosted in News, Science NewsTagged Canadian Council on Animal Welfare, Lab Views, questionnaire, survey, University of British Columbia Animal Welfare Program. I agree that the write-ups were pretty vague and I found myself thinking I could easily vote neutral for many because I had questions that weren’t addressed. I had a look at this and did the survey. Took me about a half hour to register and read through the questions and responses already submitted. I had some trouble navigating the site after registering, so perhaps that explains my slow time. The survey itself seemed to have a few problems with design. “Yes,” “no,” “neutral,” or “leave a comment” were the response options to rather broadly summarized research projects. It might have been better to isolate issues (pain management, predictive value of the model, relevance to medical science, and so on) and then gather graded feedback on those specific issues for each research project. But I suppose I could have written a long comment for each project.